If you've heard either Funset's "Pumpkin Ragga" or Habanot Nechama you probably already know that Karolina (Keren Avratz) has an amazingly flexible and expressive voice and is a very capable songwriter. When she sings in English her Israeli accent is thick enough to cut with a knife but somehow that doesn't matter. 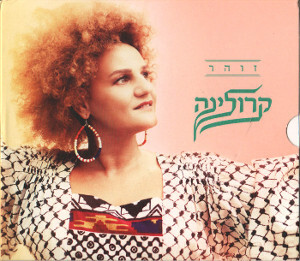 "Zohar" (Glamor) is her second solo album. The original CD was rather short and included two different versions of Al Te'ahar (Don't Be Late), with an acoustic rendition closing the album. On this album she drops the soul and reggae influences which were so evident on her first album and with Funset and adds a little Mizrahi flavor, even though she is not from that tradition. Zohar, with the exception of her Chanson For Lebanon, has a much more contemporary feel. The words are entirely in Hebrew with the exception of "Save Me From Myself", and surprisingly that may be my favorite from this album. The new version adds an EP of covers, three well known Israeli songs from the '60s and '70s plus a collaboration with Boom Pam on a version of Led Zeppelin's Black Dog, with a surprising amount of Middle Eastern flavor added to the instrumentation. Karolina practically channels Cilla Dagan, who sang the original version of Yom Bo Yakom, and does a beautiful rendition of Zohar Argov's Tzel Etz Tamar (Shadow of the Palm Tree). This is an album I just keep going back to again and again. Definitely pick up the Special Edition if you're going to get a copy of Zohar. It's more than worth a little bit extra to hear Karolina rework the old songs.